The Amsoil Nelcar Legends Tour was back at Beech Ridge Motor Speedway this past weekend for round four of VIP Thursday Thunder. It has been an interesting first three rounds to say the least. While the main player has been some big incidents on the track, the competition has never been closer throughout the field. 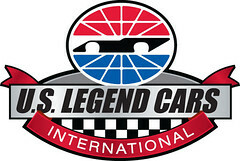 Each week the field is separated by mere tenths on the track, and that has lead to some of the most exciting racing the fans have ever seen out of the Legends Cars. The Legends were ready to put on the finale once again on the fourth round of VIP Thursday Thunder. It was an all senior citizens front row as the 38x of Terry Kirk was on the pole running fellow competitor Matt Bourgoine’s backup car while the former champion Bob Weymouth in the familiar 399 was on the outside. On the start the two ran side by side, before Kirk grabbed the lead withWeymouthright behind in second. The two longtime competitors were putting on a good show up at the front. At the races halfway point, contact in the middle of the pack between the 05 of Mike Ordway Jr. and the 8 of Matt Chagnot sent Chagnot for a spin in turn two, ending both drivers night (***we were spun out by the 05, but it did not end our night early... the #8 went on to a 14th place finish***). On the resulting restart, Kirk was once again able to get out to the lead, while the field behind them really bunched up looking for more positions. There was a new challenger at the front however, after the long trip back to Maine after running the Big Money 100 at Charlotte Motor Speedway earlier in the week, Ryan Hammar fought his way to the outside of Kirk, as the two ran side by side for the final laps before Kirk was able to clear himself of any challenge, and grab a very popular victory! Weymouthwas second while Charlie Buxton, Evan Beaulieu and Matt Bourgoine rounded out the top five after starting at the rear of the field.